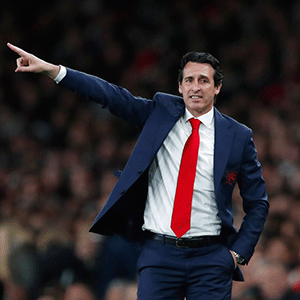 London - Unai Emery challenged revitalised Arsenal to write their own history after they climbed to third place in the Premier League with a 2-0 win against Newcastle on Monday. Aaron Ramsey's first half strike was followed by Alexandre Lacazette's killer second in the closing stages at the Emirates Stadium, maintaining Arsenal's impressive progress under Emery. Emery's side climbed two points above fourth placed Tottenham and fifth placed Manchester United to bolster their chance of qualifying for the Champions League via a top-four finish with seven games to go. "We have been speaking all season about the final third, you have to spend 50 million, 75 million (to have players to make a difference)."